Hi there, so just been looking at updating my vehicle and having a look around the car dealers over the weekend, I've come up a couple of times at different dealerships of cars being advertised as a certain year but on further investigation found the vehicles to be much older (by 3 years) this is evident by the date on the seatbelts and the VIN, on asking the sales rep about this I was told by one not to worry about it, as they most likely had to have its belts changed in Japan for whatever reason, yeah right! The other told me it's was because they use the year of registration as to what year it is? crikey if that is the case I'll register the car today and when I sell it I'll call it a 2019 model! So what gives with this? wow that is a new low! Hmm I had a somewhat similar experience re first registration. Mid Feb I picked up a brand new ute from Christchurch Mitsubishi for a work colleague, registered as a 2019 Mitsubishi Triton, buts its definitely not the new shape 2019 Triton, its exactly the same as mine which is a 2018 but registered as a 2019. Not sure how that works but I'm sure there is a very logical explanation. One of those intermediate type industries, positioning themselves between buyer and seller, and taking their cut. I have learnt one thing in life. Never believe anything a real estate agent says. Not one word. Ever. Don't ask me how I know. Probably 2 or 3 crashed cars stitched back together. Avoid at all costs! Good that you are doing your due diligence. The VIN rules, and is easy to decode online. Heh that's exactly what I bought once! Bought a Subaru STI wagon, when I sold it the guy emailed me and said "umm I'm a professional welder, did you know your car is actually 2 cars welded together?" I almost died. Didn't even know you were allowed to import a car like that! I'd say that's a little different to what the OP is suggesting. I think of that as say they release a new version of a Honda Accord in August, it doesn't make the older shape one you buy in July this year, a 2018 car. I see it a bit with new motorbikes, owners will buy but not collect until January, so they can be registered as a newer bike. New dealers aren't likely to hold something on their lot much longer than a year anyway. People will refer to cars as specific years, but they do tend to run for a few years, with some little face lifts. I think the OP is talking about them blatantly saying a car that was probably first driven overseas in say 2010 (in regards to the seatbelts) is a 2013 car which might be nearer the end of that vehicles particular release cycle. Model years don't coincide with calendar years. Your colleague probably had the choice of ordering a new model or taking an older model at a discount. The year on your registration is at the point it was first registered, which as others have mentioned is not the same as the model year. As you have stated, there are other ways to establish the actual model year or even build month/year, but most people wouldn't have a clue that there is a difference. You will find that it is quite common with new car dealers that on-hand stock will only be registered at the point of sale, so they don't have to pay any overheads on it just sitting there. So you may have cases where older stock sits around for awhile, then gets registered as a new vehicle. Which should hopefully be different with built-to-order sales models, but more likely they will just sit around in a warehouse rather than on the yard. And second hand car dealers definitely have a reputation for a reason. Trustworthy, honest ones seem to be the exception, not the rule. You need to understand how manufacturing of vehicles and mass production works in general. If I make a model for 8 years. Lets use the BMW E36 for example. The cars made in 1991 had the same seat belts as the one I own made in 1999. The car I own made in 1999 has the same seatbelt stalk as a BMW E30 from 1980's. Every other manufacture is also the same. They will order a million seatbelts from ZF prior to a production run. They then finely balance stocking and ordering more parts etc. Long story short guys it is economics of mass production and them manufacturing or buying parts in runs rather than making for each individual car at the time. 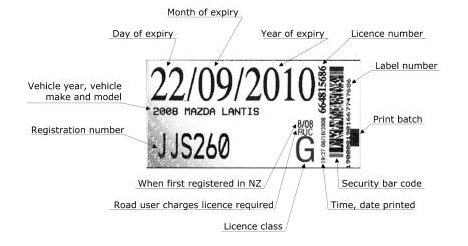 The Rego label discriminates between model year and date of registration. Exactly but you would find this out after the fact remember these are Japanese imports I'm talking about, they are not registered until after you have bought them, my problem is that if you state a vehicle is a 2012 but it is in fact a 2009 you can get many thousands of dollars more for it, so I'm c confused about whether this is actual illegal practice. Did the cars you were looking at have any km's on the clock, aside from delivery kms? Years ago, I did hear of a bunch of Alfa Romeo 166's that came into the country, sold as new cars here, but they were ex Singapore. The thing with these is they were never registered in Singapore, so technically, were still new cars, just a couple of years old. They'd been imported into Singapore, but never sold, they'd been sitting in a warehouse for a year or two before coming to NZ. TENKAN: Exactly but you would find this out after the fact remember these are Japanese imports I'm talking about, they are not registered until after you have bought them, my problem is that if you state a vehicle is a 2012 but it is in fact a 2009 you can get many thousands of dollars more for it, so I'm c confused about whether this is actual illegal practice. No you cannot. I have no idea how you have this misconception in your head and if you went to a car dealer and suggested this I bet they would fall over backwards laughing.. The VIN includes when it was manufactured, then the MODEL YEAR of the car which is then displayed on the label, the modem year is the same year that the car is made and expected to be in the intended country. The date of registration is just when the plates went live.